I used to be an Engineering Duty Officer in the US Navy. That was back in the 1990's. EDO's work in shipyards and in various capacities related to the procurement, construction and maintenance of US Navy ships. Today, this activity falls under the command of the Naval Sea Systems Command or NAVSEA. Back in "the old days" NAVSEA was known as the Bureau of Ships - or BUSHIPS for short. 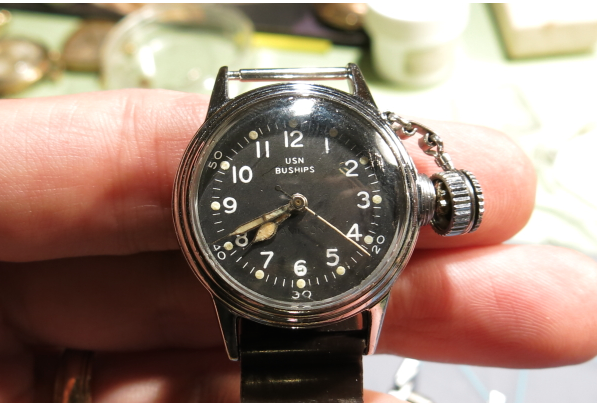 There are a couple of Hamilton military watches that were made for the Navy - and specifically for the Bureau of Ships. 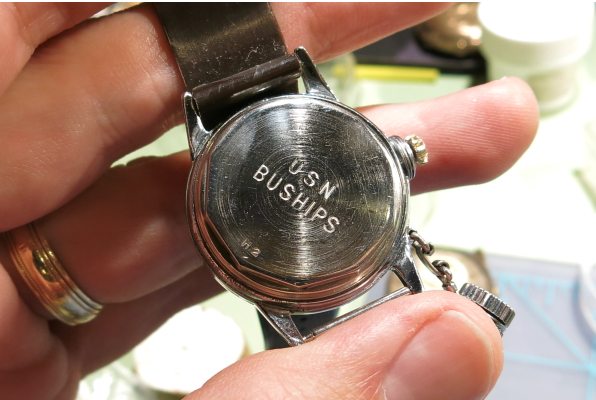 These watches have USN BUSHIPS printed on the dial. 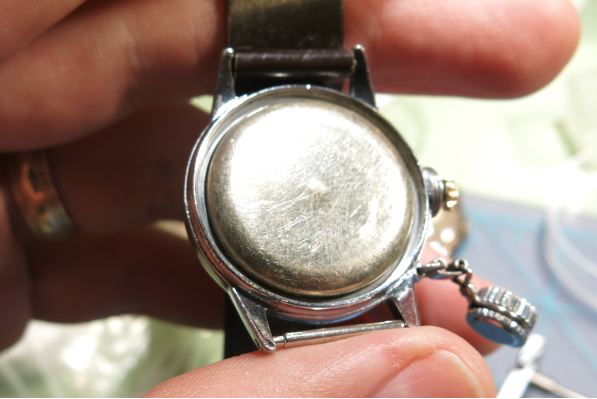 One of the less common watches is the Canteen watch. It has a special waterproof case with a captive screw-on crown cover so the case looks like a canteen on its side. The glass crystal is actually held in place and waterproofed with lead solder. The back of the case USN BUSHIPS and H2 is typically engraved, sometimes with a serial number. 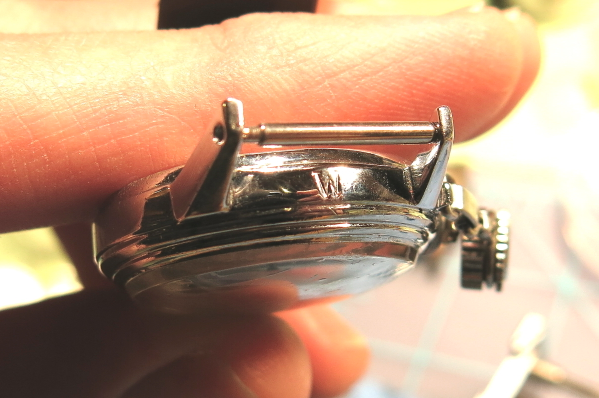 This case was made by Wadsworth - which is denoted by the W between the lugs. Under the screw-off case back you will find a rubber gasket surrounding a dust cover that snaps onto the movement ring. 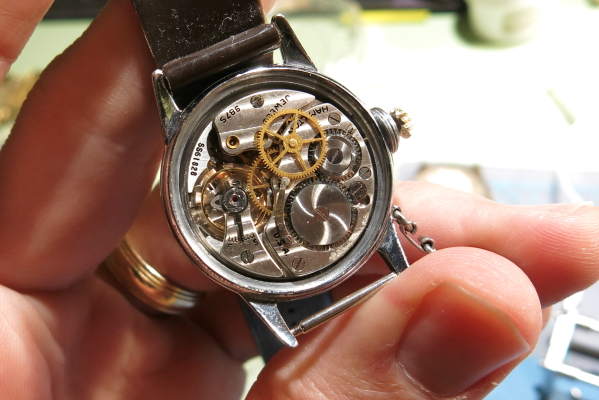 Under the dust cover is a 17 jewel 987S movement. This was Hamilton's first sweep second movement. 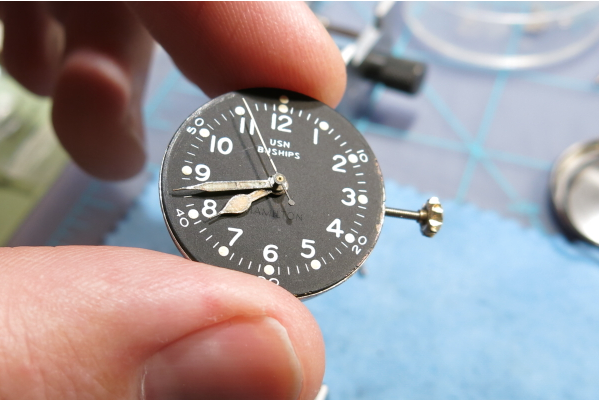 It shares most of it's parts with the 987A, which has the sub-second hand at the 6:00 position. On the dial you can see HAMILTON printed in black on black, just above the 6. 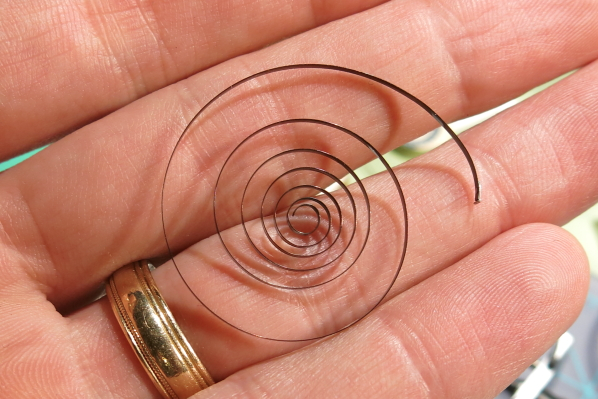 As part of the overhaul, I had to replace the mainspring. As you can see in the photo below, these old mainsprings can become "set" and lose a lot of their resilience and run-life. And here's the finished product, all cleaned up but definitely not a candidate for water-environments. These watches are quite valuable - and too valuable to risk getting wet. My husband is Navy EOD and I'd love to get him one of these watches. Do you know where I might find one for sale. Very cool piece! 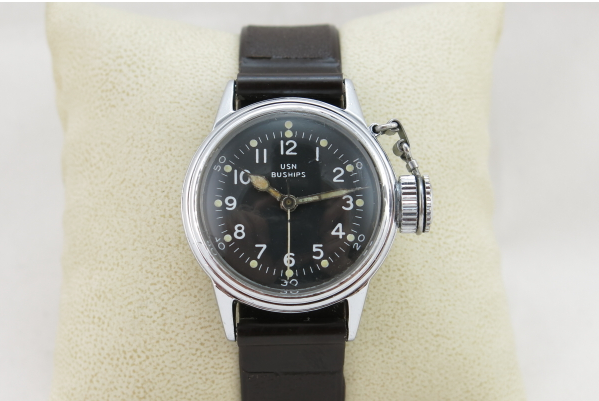 EBay or perhaps on the military watch forum. They're not in expensive though. Expect to pay well ove $1,000 for a nice one. Hello I really like the story of this watch! Did you restore it yourself? I live in France, do you know where I can get one in good condition? Thanks for your help!